On Monday, Buzzfeed had a post titled "The 27 Most Powerful Photos of Guy Fieri Pointing At Things," which had pictures of Guy Fieri pointing at things such as fans, food, celebrities, microphones, etc. 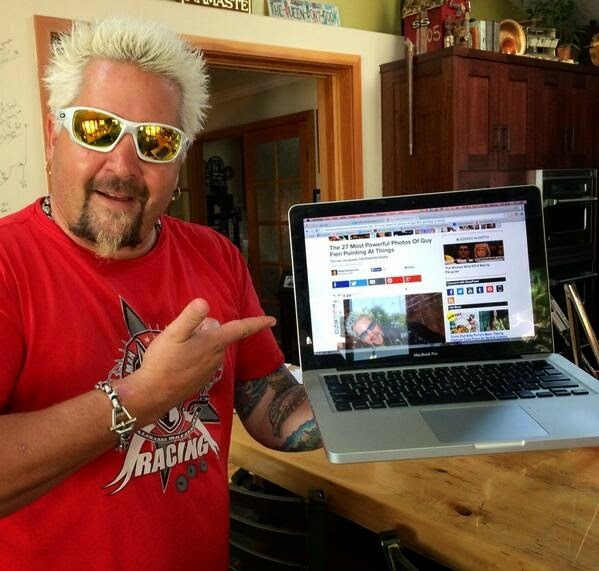 Yesterday on Twitter, Guy Fieri posted a photo of himself pointing at the Buzzfeed post on a laptop on with the caption "#28" and tagged Buzzfeed and the author of the post. Nice to see Guy Fieri has a sense of humor and can poke fun at himself. Not a big Guy fan, but you gotta love that he doesn't take himself too seriously. Pam, you are so right! I'm not from the south, but we lived there in the early '70's. Things have changed and will continue to change. In my lifetime, things have changed over and over again. Every generation thinks that they have all of the answers and they are the ONLY ones who are eligible to judge if something is acceptable or not, in the past and in their lifetime. We thought that we had the right to judge our parents and grandparents, too, and decide if they were evil or good, right or wrong. What the younger people here don't realize is that everything will change again and that THEIR kids, grandchildren, etc. will eventually believe that they were terribly wrong and shortsighted in 2014 and the beliefs they hold now will be deemed wrong and prejudiced and that they were bigots, criminals, and evil, too. So all of you making the judgments here about what you believe now..your time is coming and your beliefs now will be questioned. And you have the mouth and mind of a small minded, judgmental who will soon be past your prime. Karma hurts and ALWAYS come back to bite you, Princess. These so-called things didn't happen in Paula's restaurant, The Lady and Sons. Supposedly, they happened in her brother's restaurant and she wasn't even there. She has spent most of her time on the road and working away from home and is very rarely at home. She said in her court deposition that she is not actually involved in the operation of neither one of the restaurants (her brother's restaurant is closed) and hasn't been for years. They have had a corporation that runs the restaurants and Paula doesn't even know what is happening with the restaurants. Do you actually believe that any of the chef or cook/owners who are on Food Network are in charge of any of the restaurants or corporations that they own? They just plain don't have time to do both, write and promote books and travel, be that active on TV, travel to festivals, promote their products that have their names on them, etc. No, they have partners and people who run those businesses and have huge groups, agents, and corporations behind them to do it for them. Read her court testimony online and learn a few things, Lucy. You are misinformed and don't seem to be bothered to know the whole story. You think you have it all figured out without the actual facts. Oh I'm so hurt. NOT. Im sorry you feel as though this overt bigot can somehow redeem herself. She's had too many chances already and somehow manages to dig herself a bigger hole each time. It is the 21st century, dear. Racism has no place here. By the way, you don't look a spring chicken to me either, sweetheart. Maybe stay away from the unlimited buffet, hmmm?